← Nature vs. Nuture: How Much Does Our Parenting Matter? I know that with a baby in the house, there’s no point in buying anything nice. Kmart, Target, Big W…. that was my scope at first. I mean, you can almost always find your basic cotton shirts there, right? And, with three kids in tow, I wanted to do a quick in and out, but I soon realised that I wasn’t going to easily find what I was looking for. Everything I found was either made from polyester, polyester/cotton blend or viscose. Hmmm… no thanks. I mean, in summer?! So, I thought I’d try the more expensive shops. Cotton On (um hello…. *cotton*), Jeanswest, a few more… Checked the labels on the shirts, and to my surprise, they were made from the same type of fabric as the cheap places! Polyester, polyester/cotton and viscose, grrr! I even checked the hippie shops… where I’ve been buying cotton clothing since I was a teenager. Nope. No cotton there either. All of the cotton has been replaced by viscose. Although viscose is technically classified as ‘semi-synthetic’ because it does contain a little bit of plant product, it’s still synthetic in my mind. I’d love to splurge on the ethical organic cotton, but well… that just blows the budget, unfortunately. A couple years ago, I noticed this trend of clothing companies using more and more synthetic fabrics, and I thought maybe it was something that was only happening in a Australia. But, when I went to visit my folks last year in America, I found the same crappy fabric in all of the clothing. Oh, all I want to do is frolic around in a light cotton dress… Or putz around the house in a loose cotton sleeveless shirt… but I can’t find any! Not a single one! I love how cotton feels. I love how it’s not made from petrochemicals that are mined from the earth. Like, do people even know that synthetic fabrics are actually plastic?! PEOPLE, YOU’RE WEARING PLASTIC! Gross! I love how cotton doesn’t make me sweat profusely and just in case I am sweating profusely already, at least it lets me breath. My mother told me that when I was a baby, in the early 80’s she couldn’t find cotton baby clothes for me ANYWHERE! She got so annoyed that she started making my clothes. I hope it doesn’t come to that (luckily most kids clothes are made from cotton), but if it does, I’ve got my sewing machine ready! Come on clothing designers, read my post and start making cotton clothing again. And, while you’re at it, stop putting the tags on the side of the shirt, those are scratchy as hell and I have holes down the sides of all my shirts and my kid’s shirts, from ripping the stupid tags off the side. I live on the steamy far north coast NSW and have been doing the exact same search for the last few months. Cotton pjs are also very very hard to find. I read an article by a kiwi ethical fashion designer recently who only uses organic cotton and she said cotton is becoming a luxury item as synthetics become cheaper to produce. Who would of thunk it? Viscose is overly chemically produced wood pulp and definitely doesn’t breath the way cotton does. As a hot post partum mum on a budget too, I did find a couple of cotton loose sleeveless shirts at big w in October but there was a lot of tag checking that had to be done. Sussans has a small section of flowery cotton pjs, the rest are viscose. Outlet mall Harbourtown Bonds has a classic cotton tee (good fit, lift up to feed) and Harbourtown Esprit still has a lot of cotton including cotton tailered shorts $25 atm. Sweet! 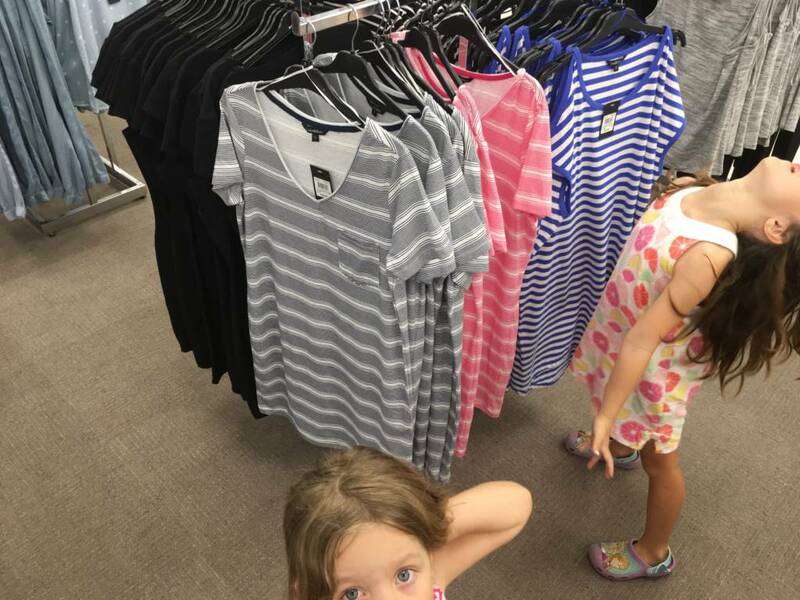 Target still is good for cotton clothes for the kidlets but as my toddler enters the size 4/5 the synthetics are unfortunately creeping in. Oh thanks for that! Gah, hope cotton catches on again soon! They cloth nappies are still sweaty!!! I use both and sometimes think the cloth ones are sweatier. I found organic cotton t shirts for the kids and I at Best and Less for very reasonable prices. Hi Kate. I have just found your blog and am loving it 😁 I buy men’s small or extra small t-shirts… They are still cotton! I know that feel. Ma & I went shopping for cotton tanktops to fight off the summer heat. Went to 10 different clothing stores & everything is spandex, polyester, rayon, viscous, & nylon; all things that trap heat into the body, two that promote sweating. Yuck!!! Hope you find something cooler! I live in Chicago and I just googled “where did all the cotton tops go” and found your post. Thank you for confirming I’m not the only one who wonders what’s up with this! It seems like most the cute tops I look at are polyester or rayon, and a basic cotton shirt is rare. Frustrating! Bring back natural fibers! Oh hi! And, wow, isn’t that so annoying!! At first, I thought it was just an Australian thing, but then when I visited America 2 years ago to see my parents, I found the same thing! Argh! I think they’re coming back though… I went to Kmart the other day and was surprised to find a few more than usual. Argh! It’s the same exact thing here in Canada too! So frustrated! I’m clueless where to buy simple cotton clothing now, it’s getting super hard to find! Argh! It’s so annoying! I hope you find something… maybe try shopping online. To give you *some* hope, I’ve started to see more cotton in the shops lately. Fingers crossed..
I’m also from tha US and have found some new designs at Walmart that are cotton/modal blend. They seem to be redoing some of their brands. I wish target would because I usually like some of their stuff better. Oh, I hope so too! Yes, I’ve seen a few more cotton things hit the shelves recently, let’s hope the trend continues. I got rid of a lot of clothes over the last couple years, and when I went to replace them, all I could find was junk(both the weird styles and the cheap, uncomfortable synthetics) at my favorite stores and at more expensive stores. I’ve been searching for places to buy natural fabrics and I’m glad to hear I’m not the only one! Nordstrom allows you to search their clothing by fabric(I wish all stores did), so you should be able to find some cotton pieces there. They ship all over the world. Good luck! I’ve been seeing more and more cotton back on the shelves! Hooray! I’m on a mission to find out what’s going on with the no cotton. Two things I’ve found so far; China is somehow cornering the market and (this explains a lot) cotton growing depends on a lot of water irragation.